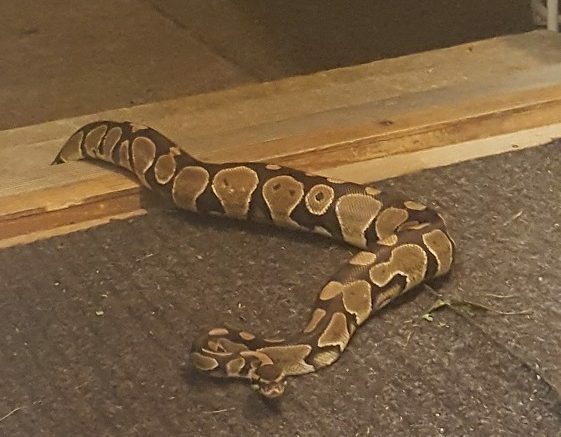 Chilliwack – Responding to calls of animals in residential areas is not uncommon for the RCMP but on the night of August 26, 2016 officers were squeezed into action after receiving a report of an unwelcomed snake behind a residence in the 45000 block of Spruce Drive. General Duty officers arrived at the address to discover a three foot long boa constrictor in the back yard of the home. The serpent’s activity was constricted by police until a reptile rescue company arrived from Abbotsford to apprehend the boa. “Unfortunately, exotic pets are abandoned or, escape from owners, which could lead to a dangerous encounter for both the public and the animal. Our officers were never rattled during the apprehension of the snake and no one or other animals were harmed. The snake is in the safe care of a reptile facility,” says Corporal Mike Rail, spokesperson for the UFVRD. Be the first to comment on "Chilliwack RCMP Nab A Boa"